With five new ships on order and 10 vessels undergoing refurbishment under Royal Caribbean International’s four-year $900 million programme, boss Michael Bayley is gearing up for another busy year. Sophie Griffiths catches up with him to hear Royal’s plans for 2019. “The UK is a very important market for Royal Caribbean – we’re not changing that perspective. We continue with the belief that this is a turbulent time but it will pass. No one will benefit from a no deal." Michael Bayley is in a good mood. It’s a cold, grey January day in London, the UK is about to be plunged further into political chaos as Theresa May braces for MPs to vote on her ill-fated Brexit deal (she later suffered the greatest defeat in UK political history) and we’re discussing the impending entrance of a new competitor into the market. But Royal Caribbean International’s boss is characteristically upbeat. “I think it’s great,” he smiles excitedly in reference to the imminent launch of Virgin Voyages, which will go on sale in February. It helps, of course, that the new line will be adults-only, “an interesting model” Bayley acknowledges, but one Royal is unlikely to follow. “I would never say that we would never look at an idea that would have legs and be attractive to our guests. But it strays a bit from what we are – we’re multigenerational… But good luck to them,” he grins. I ask whether Royal Caribbean has measures in place to mitigate a negative impact such as the predicted fall in the pound should the UK leave the EU without a deal. “There’s very little we can do to put measures in place for currency,” he concedes. Not only is the line adding capacity in the UK with its 4,180-passenger ship Anthem, it is also investing $900 million in its Royal Amplified programme, which will see substantial refurbishment of 10 of its ships over four years – including UK favourite Independent of the Seas in 2018. 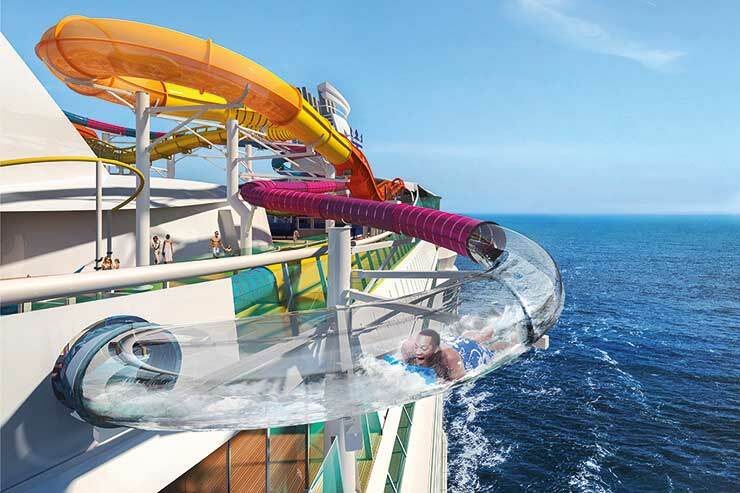 A further four ships will follow suit this year, the first being Navigator of the Seas with a $115 million refit that will see all staterooms and public spaces revamped and new features added, including slides The Perfect Storm and The Blaster – the longest waterslide at sea. Oasis and Allure of the Seas will follow later in the year, with features from Symphony of the Seas added, such as Playmakers and the Ultimate Abyss. Royal’s new-build vessels meanwhile, will adopt one of the key features onboard the newest ship of sister line Celebrity Cruises’ Celebrity Edge – the Infinite Veranda. “Edge has a lot of innovation. We need time to assess what works well and what doesn’t but we will take on some elements and put them on the new class of ship – Icon class and potentially Oasis 5,” he says. Of course, Celebrity Edge is a game changer in many other ways too, not least for its focus on gender equality among its crew. Women comprise 30% of its onboard staff compared with the industry average – thought to be in the high teens – a goal championed by Celebrity’s chief executive, Lisa Lutoff-Perlo. On this latter point, it would be remiss not to mention the tragic death of 20-year-old British cruise worker Arron Hough, who went missing while onboard Harmony of the Seas last month. At the time, press reports questioned his mental health. Bayley acknowledges the issue is a concern for the line and reveals it is an area it has invested in. This includes a new confidential freephone helpline that crew can call “if they’re feeling vulnerable”. It’s currently undergoing a three-month trial on two of the line’s ships but Bayley says his “hope is that if the trial is successful we will implement it throughout the fleet”, with the aim of it being available to all crew by the end of 2019. Elsewhere, other focuses for the line include Royal’s continued investment in its technology initiative, Excalibur. I ask if Bayley is concerned by Princess Cruises’ introduction of its wearable tech innovation Princess Medallion. He refuses to be drawn on this but says: “We’ve had the WOW band [a wristband that allows passengers to enter their staterooms and buy drinks onboard] on our Oasis-class ships for a while but we’re moving more towards the ‘userability’ of devices now. “We’ve invested heavily in Excalibur, which will allow guests to use their phones to open the door and pay for things that way through an app. I believe the future is having applications that work on multiple devices,” he adds. Such tech is revolutionary for the cruise sector, but Bayley admits the line “hasn’t really made a big deal of it”. “Our philosophy is let’s really make this tech right and relevant, and our guests will really enjoy what we’re giving to them. And with that, our time is up. The breaking news apps pop up on our own devices informing us of Theresa May’s impending defeat. But with sales remaining strong and research suggesting Brits are keen to continue getting away from the UK’s ongoing political drama, Bayley will likely have reason to keep smiling yet.